Jump to article » This article sharing Sacramento Rodent Control information is provided by Pest Control Sacramento Company Specialized Pest Patrol, Sacramento's leading provider of pest control. We serve Sacramento, Folsom, Elk Grove, Roseville and many other locations. Call 916-987-9559 (Pest Control Folsom) and 916-224-7430 (Pest Control Sacramento) and get your first rodent control service free! Specialized Pest Patrol of Sacramento has over 2 decades of experience performing effective affordable Sacramento Rodent Control services for residents and businesses. Learn how to prevent rodents from entering your house with the facts we’ve provided on this page. Why Do Rodents Want In? Your home is your safe haven. It provides you protection from the elements. It keeps you warm during the cold season and cool when the temperatures rise. These reasons you love your home are the same reasons why rodents want in. They are seeking a safe shelter from the elements, a warm, cozy place to snuggle up. But that’s not the only reason rodents might be attracted to your home. Other factors that can cause rodents to be drawn to your home include food (whether it is open food on the counter, food in the cabinets, pet food left out at night, or even an open trash can), access to water (dripping faucets, leaking pipes, pet water bowls), and clutter (which makes the perfect hiding space). Rodent Control Company Specialized Pest Patrol removes Rodents of all types such as Norway Rats effectively and cost-effectively like those shown in video below. Gnaw marks on just about everything – furniture, clothing, toys, books, food packaging, boards, boxes, and more. Rodent droppings (you may find these in cabinets). Debris scattered everywhere. Rodents are far from neat, and will leave trails of debris. Finding nests. You may find rodent nests when cleaning certain places, such as your attic or garage. Hearing noises in your walls. Because rodents are nocturnal, you may hear scratching in your walls as you are going to bed. Rodents are a major household problem, being both destructive and dangerous. Rodents chew just about everything they come across. They can ruin your personal property, and your food. They can even damage the structure of your home, chewing on support beams and insulation. What’s more, rodents will chew wiring. This can lead to a power outage, or cause a potential fire hazard. Rodents (more specifically their droppings and urine) can aggravate allergies, and lead to asthma attacks in both children and adults. Finally, rodents can be extremely dangerous. They are well-known for carrying disease and parasites, such as Listeria, Salmonellosis, Hantavirus, and Bubonic Plague. Diseased rodents contaminate every surface they touch, and can easily spread their diseases to anyone within your Sacramento home that come into contact with these surfaces. One of the first things you need to do is to inspect your home for potential entry points, and take action to seal them. Take a look at your foundation. Rodents can squeeze into extremely tight spaces. Any holes or gaps should be filled. Inspect around doors and windows, ensuring that there are no gaps. Also take a look at any vents that lead to the outside, such as your dryer vent, as well as pipelines. Place a mesh screen at vents, and seal around pipe lines. Pest Control Sacramento Company Specialized Pest Patrol performs effective rodent exclusion near you effectively and cost-effectively like in video below. Rodents can run, climb, and jump long distances. The bottom floor of your home is not the only place that they can get in. They can also get in through your roof. It is important that you inspect this area as well. Cover any vents, check for gaps around any windows or wire lines (and seal them). You should also inspect for roof lines, gaps in your eaves, or gaps in between boards. Close off any of these potential entry points. Rodent Control Company Specialized Pest Patrol removes rodent infesttaions in your home similar to what’s shown in video below. While it may be your home that rodents are after, your yard can entice them in, and can even provide them the assistance they need to get in. Tall grass can provide them cover from potential predators. Bushes can give them a lift to windows, and trees (with limbs that extend over your roof) can provide easy access to the upper levels of your home. Make sure that you keep your yard neat. Cut your grass regularly. Trim back the bushes and tree limbs. This will discourage rodents from even trying to get close to your house in the first place. Rodent Pest Control Company Specialized Pest Patrol performs affordable and effective rodent control methods in Sacramento as shown in video below. Rodents are, by nature, messy creatures, and enjoy a messy environment. Your kitchen is a prime target. Leftovers that have been left out in open containers, unfinished pet food, even open trash cans can be quite enticing to rodents. In order to prevent them from wanting to come in in the first place, it is important that you keep areas such as these clean. Put away leftovers in sealed containers. Dispose of unfinished pet food before going to bed. And be sure to avoid clutter in your home. Clutter provides hiding spaces for rodents. By avoiding clutter, there are less places for them to hide, and they are therefore less likely to want to stick around. Rodents are not picky eaters, and will devour trash if given the opportunity. Don’t give them that chance. Keep your trash cans inside your home sealed. When taking the trash out, tie the bags tightly and throw them into sealed trash bins. If you do notice rodents in your Sacramento home, you may be tempted to run out and buy the first trap or poison you find. DIY rodent control rarely works. Your best bet to preventing, and getting rid of, rodent problems is with professional assistance. Rodent Control Sacramento Company Specialized Pest Patrol is your Sacramento, California pest control experts. In order to prevent rodents from entering your home, we perform effective exclusion techniques. Exclusion involves the inspection of your home to locate any potential points of entry and take action to seal them. We will inspect everywhere, including your roof and your garage. By taking these preventative measures, we can help you to keep your home a safe haven for you and your family, not for rodents. Your Sacramento home is your sanctuary. When rodents invade your sanctuary, it can lead to serious problems. With your home properly protected, you can rest easy knowing that these furry little pests won’t be able to get in, keeping your home yours. For more information, or to schedule your consultation, call the experts at Rodent Control Sacramento Company Specialized Pest Patrol today! No matter if it’s rodent control, rodent exclusion or other pest control issues that you need handled; Pest Control Sacramento Company Specialized Pest Patrol can take care of them for you in an efficient and affordable manner. Contact Pest Control Sacramento Company Specialized Pest Patrol today to schedule an appointment, get a free estimate or get free pest control for first time residential customers! Specialized Pest Patrol of Sacramento has over 2 decades of experience performing effective affordable Sacramento Rodent Control services for residents and businesses. Learn how to keep rodents out of your garage with the facts we’ve provided on this page. What Attracts Rodents to Your Garage? Warmth. Rodents seek out warm locations to protect them from the cold outdoor temperatures. Your garage provides a quiet, warm location for them to take up residence. Access to food and water. If your garage has any food source (including animal feed, food from your garden, even garbage) it can attract rodents. They will also need a source of water as well, which can even be a puddle of water on the floor from a leaky pipe. Clutter. Clutter provides rodents with ample hiding spaces from predators, as well as warmth. It can also provide plenty of nesting material. Why are Rodents Such a Problem? Even if you rarely use your garage, having a rodent infestation is a serious problem. Rodents are destructive, and they are also dangerous. They chew on everything, including boards, boxes, and even wires. Chewing on electrical wires can lead to the loss of power or quickly become a fire hazard (especially if your garage is cluttered). Rodent urine and droppings can irritate allergies, and lead to asthma attacks. Their presence can lead to mold growth. Finally, rodents can carry diseases and parasites, including Salmonellosis, Listeria, Hantavirus, and Bubonic Plague. Diseased rodents contaminate all surfaces and objects they come into contact with, which can put you and your family at risk. Sealing your garage is an important step in preventing rodents from entering your garage. Inspect your weather-stripping and replace it if it is damaged. Check for gaps at the base of your garage door where it meets the ground (the garage door threshold). Ensuring that there are no gaps not only helps to keep out rodents, but it can also help to provide better insulation. Check around for any other access points such as vents, drains, pipes, or gaps in any air conditioning connections. Rodents can squeeze through incredibly small spaces. Vents and drains can be sealed with fine mesh, which will allow them to stay open while preventing rodent intrusion. Make sure that any connections are sealed tightly. Believe it or not, rodents can get into your garage through your attic. For this reason, it is important that you inspect this area of your home, and take action to prevent intrusion this way as well. Again, check for any type of potential entry points, such as vents, gaps in your eaves, roof lines, or any gaps between boards. Just like with your garage, take action to seal any of these potential entry points when you find them. One of the biggest reasons that rodents come into your garage in the first place is because it provides them with quick, easy access to food and water. Whether you use your garage to store birdseed, store fruits and vegetables from your garden, or simply place your trash bags there until garbage day, these things can provide rodents with the nourishment they need to survive. Water is also crucial. While you may not store any open containers of water in your garage, a leaky pipe that drips onto the floor and leaves a puddle can provide all the water rats need. Avoid storing any type of food source in your garage. No matter how well you seal food, rodents will find it. Check pipes in your garage as well, to ensure that they are functioning properly. Another reason rodents may choose your garage is because it is cluttered. Clutter provides them with plenty of space to hide, and plenty of materials with which to build a warm, cozy nest. Keeping your garage clean, neat, and tidy will help to deter pests from taking up residence. Sweep regularly and avoid leaving anything out that can be made into a rodent home. It’s not just the inside of your Sacramento garage that can beckon rodents to come inside. The condition of the exterior of your home can play a role as well. Things like overgrown grass, which provide protection for small rodents, as well as limbs that hang out over the roof or your garage (or your home in general) can entice rodents to make their way toward your home. Keep your grass and bushes trimmed. You should also trim back any overhanging limbs. Rodents are cautious, and will avoid new things in their foraging paths. You may need several more traps than you think. Rodents can develop resistance to certain chemicals. When it comes to preventing or eliminating rodents in your Sacramento garage, your best bet is to get help from the professionals at Rodent Control Sacramento Company Specialized Pest Patrol. With over 2 decades of experience, with having the knowledge and expertise to pinpoint potential entry points, locate infestations, and eliminate them. We can help you take the necessary steps to safeguard your garage. Should you already have rodents inside we can employ a combination of strategic trap placement and exclusion. Together, we can help you to reclaim your garage and prevent rodents from ever coming back. Rodents are both destructive and dangerous. Even if you don’t make much use of your garage, it should not become a safe haven for these pests. With a little bit of work, you can prevent rodents from getting inside in the first place. If you need help, or if you notice any signs of an infestation, call the experts at Rodent Control Sacramento Company Specialized Pest Patrol today. 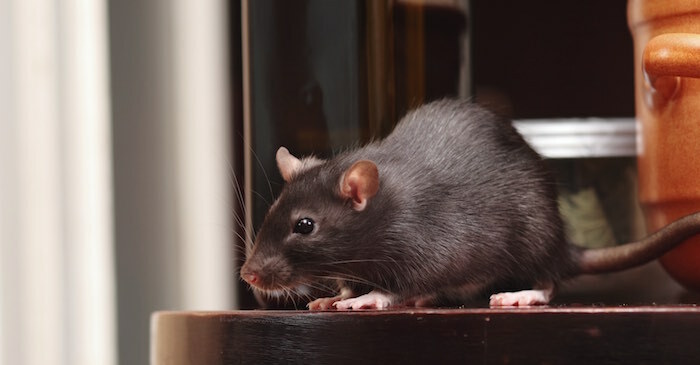 Specialized Pest Patrol of Sacramento has over 2 decades of experience performing effective affordable Sacramento Rodent Control services for residents and businesses. Learn how to get rid of rodents in the walls with the facts we’ve provided on this page. Why Do Rodents Take Up Residence in Your Walls? Rodents are timid creatures. They seek shelter in places where they can hide away from danger, including you. Your walls provide the perfect shelter for them, and an excellent place to build a nest. They can move about your home freely and stay completely hidden from view. Not only are your walls enticing because rodents can hide there, they are also ideal because they provide rodents with the warmth they seek in the cooler Sacramento months. From your walls, rodents can make their way into your kitchen, including your cabinets and pantry (where food is stored). They can also gain access to water, whether it is from water lingering in your sink, a leak in a pipe, or water dishes left out for your pets. You find gnaw marks on different things, including (but not limited to) furniture legs, toys, clothing, boxes, books, and papers. Debris throughout your home or business. Rodents are extremely messy, and will leave a trail of crumbs and different materials. You may start to notice a smell. This can be due to both rodent droppings and urine, as well as rodents that have died in your walls. Hearing scratching noises in your walls at night. Rodents are nocturnal, meaning they are most active at night. You can often hear them scurrying about in different areas as you are going to bed. A rodent infestation is a serious issue that needs to be addressed as soon as possible. They are extremely destructive creatures. They chew through just about everything, not just your personal property. Inside your walls, they can chew boards, support beams, and even electrical wiring. If rodents chew wiring, it can lead to a power outage. Partially chewed wires can lead to a fire hazard. Along with being destructive, rodents are dangerous. Their urine and droppings can aggravate allergies, and cause asthma attacks, in both children and adults. Not only that, but rodents can carry diseases and parasites, including Hantavirus, Listeria, Salmonellosis, and Bubonic Plague. Infected rodents contaminate all surfaces they come into contact with, and can spread their diseases to humans. If you discover rodents in your walls, it is important to get rid of them quickly. An important step in removing a rodent infestation from your walls is to cut off access to your home. Rodents are able to run, climb, and jump amazing distances, and they can squeeze into incredibly small spaces. Conduct a thorough inspection of your home, checking for all potential access points – vents, cracks in the foundation, gaps in windows and doors, ruined weather stripping in your garage, drains, etc. It is important to inspect all areas of your home, from your basement or crawlspace to your attic. Then seal them off. When sealing vents and drains, you don’t have to close them off completely. Use a mesh screen to cover them. By closing off access points, you prevent reentry of any rodents who have built their nests in your home as well as the entry of any new rodents. Rodents that live in your walls will leave at night to come out in search of food and water. In order to get rid of them, you can set up traps and bait. There are a variety of different traps on the market, including snap traps, glue traps, and even live capture traps that will allow you to release mice back out into the wild. What About Dead Rodents in the Walls? Sometimes, rodents die within your walls. This can be due to natural causes, or because you have chosen to use a rodent poison to deal with your infestation. Either way, nature eventually takes its course and dead rodents begin to decompose. This can often lead to a noticeable odor that can often help point you toward an infestation if you haven’t noticed any other signs. Not only do dead rodents smell, they can also attract fleas and other insects, as well as cause other issues. In order to remove dead rodents from your walls, holes will need to be drilled. Rodents may like to chew on just about anything, but they are especially cautious creatures. Anything new that is placed in their normal paths are often avoided. If you have a large infestation, you may need many more traps than you think you do. Rodents can develop a resistance to certain types of chemicals, and the chemical makeup of most commercial rodent poisons is similar from brand to brand. Poisons are often ineffective at eliminating an entire infestation. 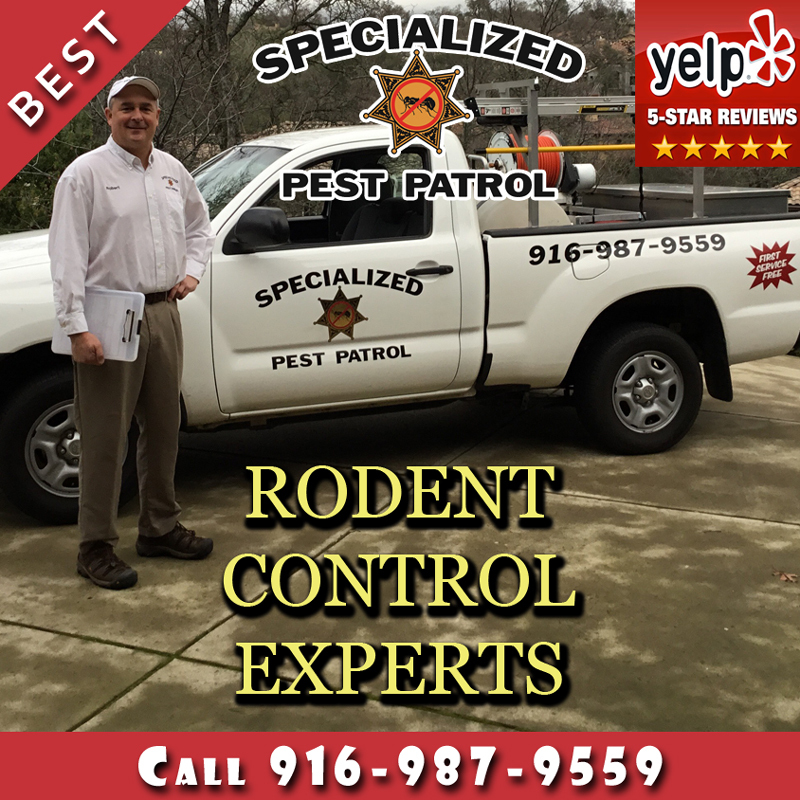 When it comes to getting rid of a rodent infestation in your walls, and preventing new infestations from forming, Pest Control Sacramento Company Specialized Pest Patrol is your Sacramento, California experts. With over 2 decades of experience, we can help you to reclaim your home and keep it yours. In order to remove your infestation, we perform effective rodent exclusion , which prevents rodents from entering your walls. We inspect all areas of your home from the ground floor (and below) all the way to the attic, helping you to determine points of entry and advising you on the best ways to seal these areas. We can then locate the source of your infestation and strategically lay traps, as well as help you to remove any dead rodents that may be lingering within your walls. Rodents in your walls can present a serious problem. Not only are they destructive, they are potentially dangerous. If you notice any signs of rodents in the walls of your Sacramento home or business, don’t delay. Call the experts at Pest Control Sacramento Company Specialized Pest Patrol today to schedule your consultation. Specialized Pest Patrol of Sacramento has over 2 decades of experience performing effective affordable Sacramento Rodent Control services for residents and businesses. Learn how to get rid of rodents in your attic with the facts we’ve provided on this page. Rodents, which include both rats and mice, are common household pests. They are clever, yet cautious, creatures are quick to take up residence in your home, where it is safe, warm, and cozy. These crafty critters can get into your Sacramento home in a variety of different ways. They can run, climb, and even jump incredible distances. They can also squeeze into incredibly small spaces. Rodents can get into your attic through cracks in boards or through vents that lead outdoors. They can get onto your roof by climbing nearby trees. Once inside, they get comfortable quickly, and can be very difficult to get rid of. Gnaw marks. Rodents will chew on just about everything. This can include boards, boxes, toys, books, furniture, and more. Debris scattered around. Rodents are far from tidy pests. If you have an infestation, you may notice that there is debris scattered all around your attic (or anywhere else that they have traversed). You may come across their nests while you are searching for something in, or cleaning, the attic. Hearing scratching noises at night. Rodents are nocturnal, which means they are most active at night. There’s a good chance that you will hear them as you are going to bed. You may be wondering what could possibly be so dangerous about furry little critters. Rodents are actually quite destructive, and dangerous. They chew on just about everything they come across. This includes wiring. This can result in power outages. It can also place your Sacramento home at risk for a fire. They will also destroy other things throughout your home, including insulation, walls, support beams, and just about any of your property (furniture, clothing, toys, books, and your food). Along with being destructive, rodents are well known for carrying diseases and parasites, such as Listeria, Salmonellosis, Hantavirus, and Bubonic Plague. Diseased rodents contaminate every surface that they touch putting your health, the health of your family, and the health of anyone else who comes into your home at risk. Rodent urine and droppings can also trigger allergies in some people, which can lead to issues such as asthma attacks. Before you can begin to get rid of your rodent problem, you will need to seal their entry points so that no new rodents can make their way inside. This will require a thorough inspection of your roof. Check for any potential points of entry, which can include gaps in your eaves, open vents, roof lines, and gaps in boards. Since rodents can climb well, you should also inspect the ground level of your home, as they can enter from the bottom floor and work their way up into the attic. Fix any issues you find. You won’t have to seal, or close up, vents completely. A fine mesh can discourage rodents from making their way indoors. Once your home is successfully sealed, you can then move on to trapping the rodents that are inside. There are several types of traps that are available. It can be difficult to know what types are best for your specific situation, or what will be most effective. This is why it is important that you seek professional assistance. We can help to locate your rodent infestation and effectively trap and remove your rodent issue completely. Once your rodent problem is taken care of, you will need to clean up your attic space. This will not only help to remove any contamination left behind by your infestation, but prevent new rodents from attempting to make their way inside as well. Rodents not only leave behind droppings and urine, they can also leave behind odors, pheromones, and parasites, as well as contribute to the growth of mold. Working to effectively remove these issues will help to not only clean your attic, but disinfect it as well. Rodents are cautious. They tend to be wary of anything new placed in their regular foraging paths. You may need an exceptionally large number of traps (particularly for a large infestation). Rodents can develop resistance to certain types of chemicals (most of which are found in most common commercial rodent pesticides). Many rodent poisons cannot eradicate an entire population. When it comes to dealing with a rodent infestation in your Sacramento home attic, the experts at Pest Control Sacramento Company Specialized Pest Patrol are here to help. We can do this in a couple of different ways. Once we locate the source of your infestation, we can strategically set up traps that will provide you with the best possible results. We may also use our expert exclusion techniques. This technique involves sealing your home, preventing reentry, as well as preventing new infestations from occurring. Together, we can help you to reclaim your home as your own. Cartoons often make mice and other rodents into cute little creatures, but real rodents are anything but adorable. A rodent infestation will not only cause destruction of your Sacramento, California home, but it can be dangerous for anyone who steps foot inside. Don’t ignore a rodent infestation. Whether you suspect one, or know you have one for certain, call the experts at Pest Control Sacramento Company Specialized Pest Patrol today. Specialized Pest Patrol of Sacramento has over 2 decades of experience performing effective affordable Cockroach Control Sacramento services for residents and businesses. Learn 6 Things You Didn’t Know about Sacramento Cockroaches with the facts we’ve provided on this page. Do Cockroaches Bite Humans In Their Sleep? Sacramento Cockroaches do bite humans in their sleep. They bite humans to eat such items off them such as fingernails and eyebrows while they sleep. Worse yet, Sacramento Cockroaches can get inside your ears! Cockroaches are a popular insect that’s removed from humans ears. Check this story on Huffington Post: Doctors Remove Live Squirming Cockroach From Woman’s Skull. Instead of the usual "sleep tight don’t let the bedbugs bite," you may want to add in "don’t let the cockroaches bite" as well. How Fast Is A Cockroach? Ever tried stepping on a cockroach and noticed it got away? Well cockroaches have extremely fast nervous systems and hairs covering their flanks which help them detect even the faintest movements in the air. Cockroaches reflexes are among the speediest of pests which love to invade homes. Once cockroaches sense a threat, they can run up to 1 meter per second and change direction 25 times per second (sounds like cockroaches would make great football quarterbacks). This speed of cockroaches is the equal to you running the 100-meter dash in a second while constantly changing direction. So you can see why catching roaches to stomp on is no easy feat. Sacramento cockroaches can survive up to 30 days without a meal, which means they can wait it out for you as a homeowner to leave food out (such as dropped food by accident). Sacramento cockroaches are adept scavengers; they will eat just almost anything to receive the food they need. Items Sacramento Cockroaches eat are oil, grease, soap, leather, and even scarier your hair and fingernails while you sleep. Can A Cockroach Survive Without Its Head? Sacramento cockroaches can live up to a week without its head. This amazing survival tactic is due to their open circulatory system. This system enables Cockroaches to breathe through small holes through their body. The only reason Sacramento Cockroaches die eventually is because they’re unable to drink water. No head, no mouth to drink. In which case, a Sacramento Cockroach can survive without water for 7 days. Can Cockroaches Survive In Water? A popular question we get asked here at Specialized Pest Patrol of Sacramento is "can Sacramento Cockroaches Survive In Water?" The answer is yes, cockroaches are able to hold their breath up to 40 minutes enabling them to survive in water for quite some time. There are many ideas how Sacramento cockroaches can hold their breath. 1 idea is that Cockroaches need to retain water for survival. Another idea is that it helps Cockroaches prevent excess oxygen from entering their body (which can hurt them in excess). Whatever the reason, nature gives Cockroaches the ability to survive under water. What Is The Life Expectancy Of A Cockroach? The two most common in Sacramento are the German and American cockroaches. German cockroaches live between 3 to 4 months. American cockroaches live between 1 to 2 years. When you have a cockroach infestation, Pest Control Sacramento Company Specialized Pest Patrol is here to help you with our expertise. 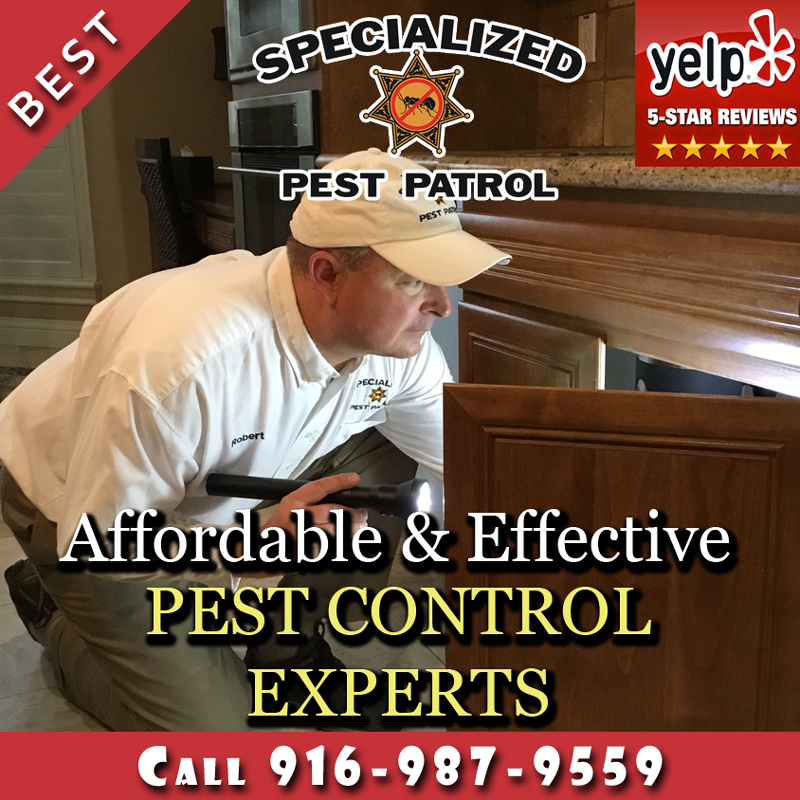 With over 2 decades of experience awards and great reviews, we have the knowledge and expertise to locate and identify your cockroach infestation. We have the equipment necessary to help us efficiently perform cockroach control and cockroach removal where cockroaches hide. This allows is to reach where no over the counter sprays can. Our cockroach removal methods are safe for your home, your office, and the people (and pets) inside. Specialized Pest Patrol removes Sacramento Cockroaches effectively and cost-effectively like those shown in video below. Cockroaches are extremely destructive. They don’t just eat the food in your Sacramento, CA home or office, they also can damage property within, including furniture, fabrics, books and important documents. Sacramento Cockroaches shed skin and leave feces which can cause allergies. Sacramento Cockroaches can carry disease, which can easily be transmitted to anyone in your Roseville home or office. Because they work at night, you have no way of knowing everywhere that a cockroach has walked. 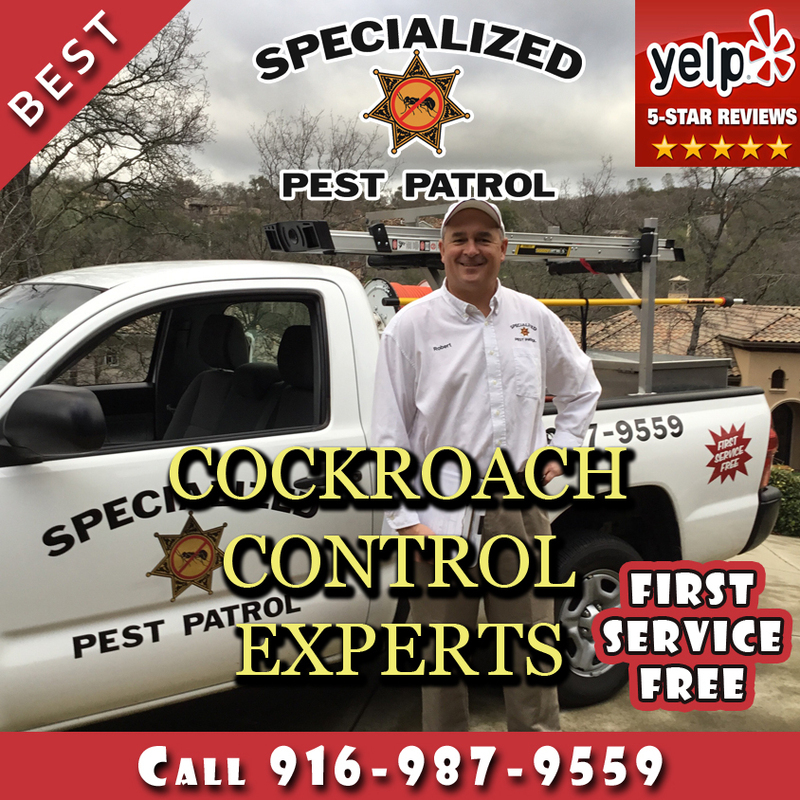 No matter if it’s cockroach control and cockroach removal n Sacramento, California or other pest control issues that you need handled; Pest Control Sacramento Company Specialized Pest Patrol can take care of them for you in an efficient and affordable manner. 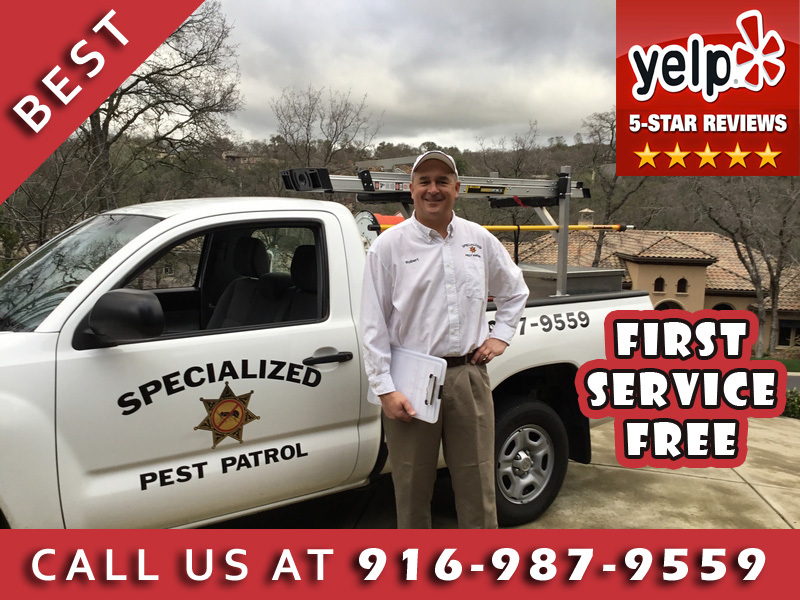 Contact Pest Control Sacramento Company Specialized Pest Patrol today to schedule an appointment, get a free estimate or get free pest control for first time residential customers! Sacramento’s warm weather is back again, but not for long. With cooler weather approaching, the likelihood of increase pest infestations in your home goes up exponentially. Some of these pests are easy to deal with through minor behavior changes around your home or business, while others are enough to cause major damage or even health problems. Cockroaches are an incredibly common pest in the Sacramento region. These pesky six-legged pests can spread up to 33 different strands of bacteria, besides being able to damage wallpaper, books, and electronics. Thankfully, if there’s only one or two in your home or business and not a huge infestations, they can be gotten rid of with a few traps, frequent vacuuming, and ensuring all food and cracks are sealed away tight. Rodents are another story. While it is possible to remove rodents, which are known to cause electrical fires from chewed wiring, spread fleas and diseases, and ruin areas with their nesting and droppings, these pests can be a significant investment of both time and money to be gotten rid of. It is also very common to spend upwards of six months trying to eliminate their presence in your home or business with little success. A professional is recommended. Bed bugs are, in general, a worst-case-scenario pest for any home or business. They are nearly impossible to remove without expert professionals, and it is highly encouraged to consult a professional pest control company at the first sign of bed bugs. Further, as they can hide easily in clothing, baggage, and even walls and floors, the removal of them can be a terrible headache. For all bedbug infestations, call a professional first and foremost. As another scorching-hot Sacramento summer comes to a close and we officially enter fall, many of our neighbors in the greater Sacramento area are breathing a collective sigh of relief. With the approach of cooler temperatures and even rain comes the promise of a rainbow of fall leaves and the freedom from 100 degree days. Unfortunately, however, just as the weather is not yet abandoning those hot summer days, summer pests are also sticking around for a little longer. Common summer pests such as fleas, mosquitoes, flies, and cockroaches are still having a field day in the greater Sacramento area, and are likely to stick around in high numbers until the temperatures really start dipping. If you are still struggling to get those common summer pests under control, give Specialized Pest Patrol a call. We’d be happy to help ensure that the remainder of your warm Sacramento days in 2016 are pleasantly pest-free. Mosquitoes have been a thorn in humankind’s side for thousands and thousands of years, but their predatory relationship with us will likely continue for even longer. Mosquitoes are also one of the most efficient spreaders of deadly diseases and viruses, and have been the cause of millions upon millions of deaths worldwide. And while Zika virus has not made its way to Sacramento yet, West Nile has, and fear of mosquitoes is reaching peak levels in America this summer. Thankfully, there are ways to help keep your family and pets safe from these annoying, even deadly pests that are so pervasive this time of year. Many people seek alternative, “natural” ways to repel mosquitoes, but only some of these alternative solutions offer any relief. Claims of Vitamin B1 as an option for mosquito control have been entirely debunked in controlled studies, while claims of garlic rubbed into the skin showed that this method decreases mosquito bites, but only for 20-40 minutes, and has the unpleasant side effect of leaving you smelling like a garlic field. So what are some natural remedies that DO actually repel mosquitoes? Oil of lemon and eucalyptus have been shown to help, but they require significant reapplication (every hour or so). The best natural remedy is wearing tightly-woven, permethrin-treated fabric over your entire body and staying out at dawn and dusk, but these are not only impractical in the heat, they’re incredibly uncomfortable. For those who want to be able to wear their shorts and sleeveless tops, but still want the best mosquito repelling available, products containing DEET or picaridin are the most successful mosquito repellents. Every home-owner or business-owner will someday find themselves considering the following: “Can I handle this pest myself?” If you’re like many others, you’ll decide: “Yeah, I probably CAN handle it myself, and for a lot cheaper!” While this is sometimes the case, it’s important to realize that even the most seemingly-simple pest incident can quickly turn into an infestation, and a cheap solution can often end up costing a lot more than just hiring a pest control company from the beginning. Try getting a quote before you move forward. 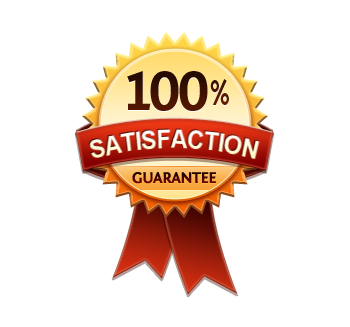 A good pest control company will happily offer you a quote for what they expect your pest problem to cost. If it’s lower than what you can guarantee you’ll pay to do it on your own, there’s no harm in trying. If you’ve already tried the DIY path and the pest has returned once, or even more than once, you know that the stubbornness of the pests is stronger than your stubbornness to not let a professional handle the problem. It’s okay to throw in the towel and let a licensed pest control company get rid of the pest once and for all. If the DIY solutions are more dangerous than the professional’s path, to humans or pets, for everyone’s sake, call the professionals to take care of it. There’s no harm in letting an expert take control of the situation, but too many unnecessary accidents happen from people who are inexperienced, no matter how well-intentioned they are. “Is this pest dangerous?” – Attempts to rid your garage of black widows or evict a raccoon family from your attic are probably not going to go smoothly, as these pests are both common and dangerous. “How difficult are these pests to remove, in general?” – Some pests are nigh impossible to eradicate once they’ve set up shop. Bed bugs are a quintessential example – they are resistant to many pesticides and know how to hide well. If any of these questions have you feeling anxious about trying to handle the pests yourself, it’s best to call in the professionals. Not only are professional pest control services more successful than DIY, they’re often cheaper, as the need for repeat full-eradication services are often diminished. 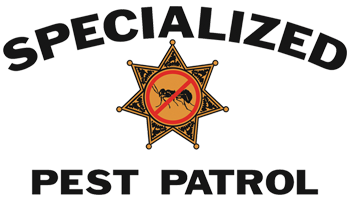 If your Sacramento home or business has a pest problem that’s too pesky to handle yourself, call Specialized Pest Patrol for expert care that gets the job done.